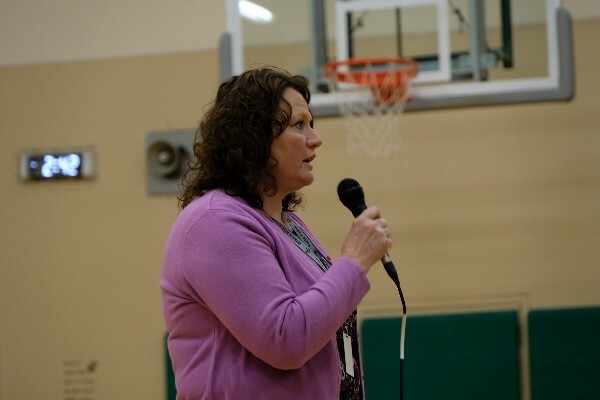 Being a mom of ten children, you could say that Mary Ann Klein, a paraeducator at Hazen Elementary School, was destined to work in education. 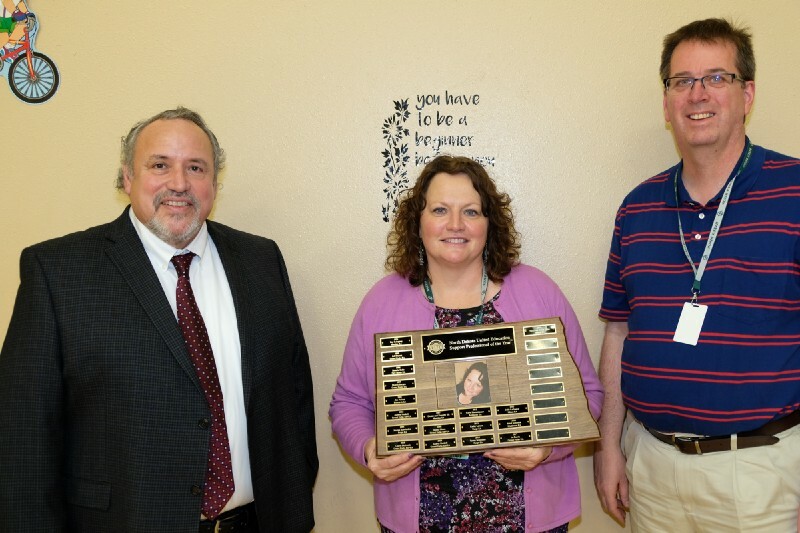 You could also say that with that much experience and compassion, it should come as no surprise that she was selected as the North Dakota United Education Support Professional of the Year for 2017. 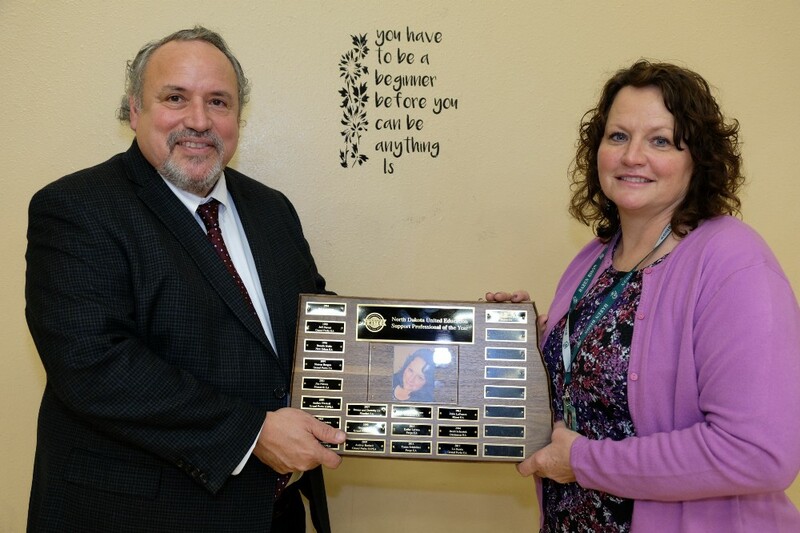 North Dakota United President Nick Archuleta presents the 2017 NDU Education Support Professional of the Year award to Mary Ann Klein, a paraeducator at Hazen Elementary School. When she first came to Hazen Elementary School, Klein had never worked in an educational setting before. In fact, she never saw herself working in education. She grew up in Cleveland, N.D., as the daughter of a rancher. Her graduating class in 1980 was made up of only eight students. She went on to graduate from Mary College — now the University of Mary, with a bachelor’s of science degree in nursing and an emphasis in health education. She had, of course, been on the other side of the education system as a parent. 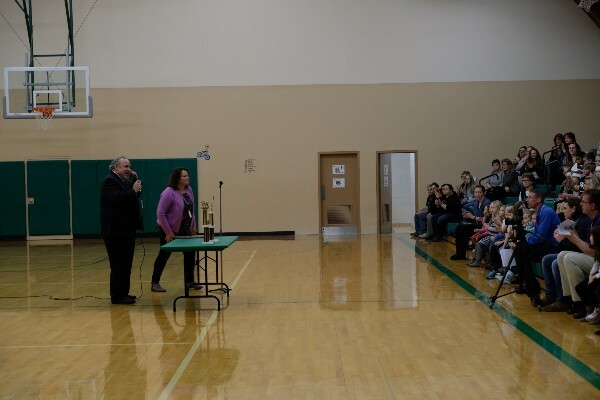 Mary Ann Klein, the 2017 North Dakota United ESP of the Year honoree, speaks to students at an awards assembly at Hazen Elementary School. Klein came to Hazen in 2012, and she described that at first, she just did what a normal para-educator would do. A couple of years later, she started working with kids who needed an education that was more tailored to their individual needs. 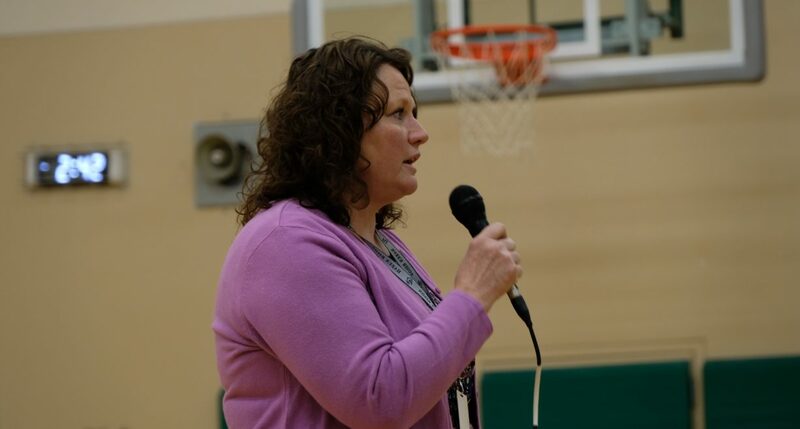 Now, Klein is a jack-of-all-trades in the Hazen school district. She is there every morning at 7:30 and doesn’t go home until after 5:00 some days. Not only does she perform her usual ESP duties, she has a before- and after-school tutoring program. She also just recently started offering to drive kids home after school or after their activities. During the summer, Klein works as a custodian for the school district. But her busy life does not stop there. Since joining North Dakota United two years ago, Klein has been a very active member. Hazen Elementary School music teacher and president of the Hazen Education Association, Chris Harvey, had much to say about this. North Dakota United President Nick Archuleta, left, ESP of the Year Mary Ann Klein and Hazen Education Association President Chris Harvey stand together at Hazen Elementary School, following an awards ceremony. Regarding the NEA Representative Assembly, Klein expressed her appreciation for Harvey. The job of an ESP is one with many challenges. To perform to the best of their ability, an ESP must have a lot of energy and a positive attitude, which Klein most certainly does. NDU President Nick Archuleta and the ESP of the Year Mary Ann Klein of Hazen Elementary School address an assembly of students. Klein works hard every day to make sure that no student is struggling. She helps them through tough times and encourages them to be the best they can be. “Every child deserves to be successful,” she said. Though working as an ESP has its challenges, it equally has its rewards. Klein said that she has experienced many different rewards throughout her career as an ESP, and these experiences have helped her grow as an educator. We know one thing for certain: the students and staff at Hazen Elementary School are extremely lucky to have Klein working for them, always willing to lend a hand.